SMU kicked off its annual Martin Luther King Day observance by participating in the City of Dallas’ 2018 MLK Day Parade on Monday, Jan. 15. President R. Gerald Turner and Vice President for Student Affairs K.C. Mmeje were among the University community members who rode the SMU float, walked the parade route on MLK Boulevard, and mingled with fellow citizens. The celebration continues throughout January with Dream Week 2018 — featuring discussions, screenings, and service opportunities for the entire campus. 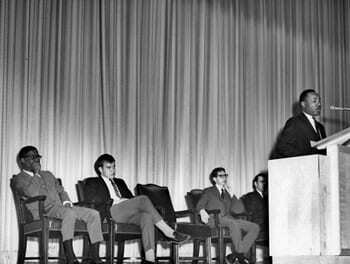 Dr. Martin Luther King Jr. spoke at SMU in 1966. Fifty years after Martin Luther King, Jr., spoke on the campus of SMU, the visionary civil rights leader’s visit will be celebrated by the University community as part of the Jan. 15-21 Dream Week activities surrounding Martin Luther King Jr. Day. Learn more about Dr. King’s 1966 speech at SMU. Headlining the list of SMU Dream Week activities is an appearance by Black Lives Matter founder Alicia Garza, who will speak about the origins of the social justice movement at 5:30 p.m. Wednesday at Hughes-Trigg Commons. A contingent of SMU representatives, including Student Body President Carlton Adams, Association of Black Students President D’Marquis Allen and former Student Senate Chair Charles Cox, who introduced King before his speech at SMU, will present a transcript of the speech and a photo from the event to the Dallas Civil Rights Museum at Martin Luther King Jr. Community Center. SMU President R. Gerald Turner will participate in the MLK Community Center’s annual fundraiser by telling the story of how King was invited and came to speak at SMU’s McFarlin Auditorium on March 17, 1966. Starting Point: 10 a.m. at the intersection of Holmes St. and Martin Luther King, Jr., Blvd. About: SMU administrators, faculty and students will participate in the annual Dallas parade and celebration. Led by the Mustang Band, participants will include former SMU Student Senate Chair Charles Cox, who introduced King when he spoke at the University 50 years ago, and SMU President R. Gerald Turner. Alumni of SMU’s annual spring break Civil Rights Pilgrimage, members of the SMU Student Senate, incoming SMU Vice President for Student Affairs Pamela Anthony, SMU Vice President for Development and External Affairs Brad Cheves and SMU student athletes and coaches also will join the parade. About: SMU students, faculty and staff will join others across the country in a national day of service. Opportunities include building fun and educational environments for children at SPARK!, organizing and restocking a Brother Bill’s Helping Hand grocery store that provides free food to more than 300 families per week, building ramps at homes of those with physical disabilities and helping prepare items for the Dallas region’s homeless. Brunch and transportation provided. Co-sponsored by the Office of Multicultural Student Affairs and Community Engagement and Leadership. About: SMU President R. Gerald Turner and student leaders will lead the annual Unity Walk, a demonstration of the University’s support of Martin Luther King Jr.’s work. All members of the SMU community are invited to join the walk, which will begin at Hughes-Trigg Student Center, continue around Bishop Boulevard and return to Hughes-Trigg. The time together is a demonstration of commitment as a university to the work of Dr. King. About: Alicia Garza is co-founder of the “Black Lives Matter” movement. At 5:30 p.m. at Hughes-Trigg, she will talk about the process of creating and spreading the hash tag that branded the movement, the controversy behind it, and her personal experiences in the social justice movement. About: “Brother Outsider” examines the life of Bayard Rustin, King’s right-hand man and chief organizer of the 1963 March on Washington for Jobs and Freedom. Rustin had a significant influence on the civil rights movement, but rarely served as a public spokesman due to his homosexuality and involvement in an interracial relationship. Sponsored by SMU’s Women and LGBT Center at 1:30 p.m. at Hughes-Trigg. From mid-September through mid-October, SMU joins the nation in celebrating Hispanic Heritage Month by recognizing the contributions, culture and heritage of Hispanic Americans. Hispanic Heritage Month was first approved in 1968 by President Lyndon B. Johnson as a 7-day observation. In 1988, President Ronald Reagan expanded the recognition to cover a 30-day period. Coinciding with independence anniversaries of seven Latin American countries, Hispanic Heritage Month begins on Sept. 15 and is celebrated through Oct. 15. SMU kicks off Hispanic Heritage Month with Viva America on Wednesday, Sept. 17 at 7 p.m. in the Van Meter Performance Plaza outside of Mustang Band Hall. Co-hosted by SMU Multicultural Student Affairs and College Hispanic American Students, Viva America is an outdoor festival celebrating all Hispanic cultures. Beginning with a flag ceremony, the festival also includes a DJ, live cultural performances, Latin food, aguas frescas and dancing. This event is free and open to the public. For more information, contact SMU Multicultural Student Affairs.